Daisy Buchanan would wear this dress. The Great Gatsby by F. Scott Fitzgerald is my favorite novel by any writer of any nationality and I’ve read it so many times—I think nearly twenty, which still seems low to me—that I could teach it. I’ve also read it in its first draft form, Trimalchio, which is an amazing experience. It makes you realize how much Fitzgerald’s editor Maxwell Perkins had to do with not only shaping the novel but getting the best work out of Fitzgerald he could. I'm re-reading it this summer. Who will join me? 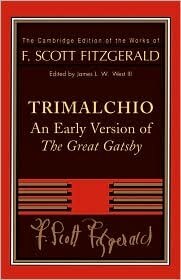 I highly recommend this book for Fitzgerald scholars. With my love of Gatsby I am very excited about the Baz Lurhmann-directed remake of The Great Gatsby, last made in 1974 with Robert Redford and Mia Farrow, with costumes by Theoni V. Aldredge (although Redford’s suits came from Ralph Lauren). The new Gatsby preview looks good and I can’t wait until Christmas Day when the movie is released! If you like Gatsby like I do then you will enjoy these flapper dresses, now on view at The Museum at FIT as part of the exhibit Fashion, A-Z: Highlights from the Collection of The Museum at FIT, Part Two. Edward Molyneux's 1926-27 sequined flapper dress. I am dying of love! It’s always a special treat for me whenever I get a chance to see a dress by British designer Edward Molyneux. They are short, sparkly and still look amazing almost a hundred years after they were made. This one is no exception. Molyneux, who was an infantry captain with the Duke of Wellington Regiment in the British Army during WWI, opened his couture house in Paris in 1919. Former employee Pierre Balmain thought Molyneux was “synonymous with elegant simplicity and refinement.” Molyneux’s couture house was in operation from 1919-1950. A 1929 Jean Patou dress of off-white silk chiffon and rhinestones. I also love seeing work by Jean Patou. The gallery text says he traveled from France to the United States in 1924 to study what he called the “American Diana.” He thought American women, with their slender, athletic figures, were better suited than their European counterparts to his elegant, sporty designs. And did you know he was a contemporary of Gabrielle Chanel, whom he considered his greatest rival? This dress by Ralph Lauren is just outside the exhibit and is a perfect introduction to the show. I love Lauren’s modern take on a flapper dress. Lame, embroidered tulle, glass beads, rhinestones. I've read almost all of Fitzgerald's stories. I sort of shamed my husband into reading a proper book, and he just completed The Great Gatsby. We're going to rent the movie (Redford and Farrow) as a follow-up, and I'm looking forward to the gorgeous costuming! I love the dresses from that era- and the bobbed hair. It was considered so scandalous! My favorite exhibit at. F.I.T. was gowns from the Academy Awards. I remembered many of them. LOve the whole post...I am also a fan of Gatsby! So much beauty, my dear JIll. I should reread the book myself before the film comes out. I like the dropped waists...though I'm unsure how I would look as a flapper. Were women my age ever flappers? Oh wow, blast from my past! I used to work for the embroidery company that did this dress for Ralph Lauren. PRL was my client and I knew this dress very well.